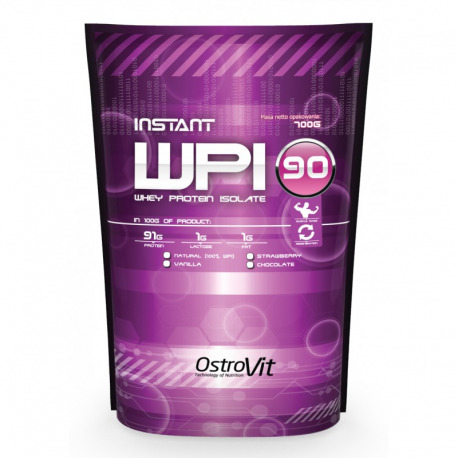 OstroVit WPI 90 Instant is a product to satisfy particular nutritional uses the body's need for protein, with intense muscular effort, especially for sportsmen. Whey protein isolate WPI 90 is particularly recommended for those seeking a quick muscle growth and improve the efficiency of the organism. This product has a very low content of lactose and fat. It is ideal as a dietary supplement in protein during periods of reduction. Used directly after training supports the regeneration processes of muscle cells. Great taste and texture make it an ideal product quality is the leader in its category at the price. Whey protein isolate used in the product brand ISOLACA is signed, the Irish manufacturer CARBERY. 30g portions of the product (1.5 scoops) in a shaker or blender. Use during the day between meals or after training.